What’s in brilliant bloom right now across the northland? Actea, a tall, magnificent perennial that thrives in part shade. In fact, plants bloom for a good three to four weeks, beginning in early to mid-September. This one involves just a wee bit of gardening, but you can handle it. All you need to do is plant it in neutral to slightly acidic soil that drains well, and keep it in dappled shade or somewhere it won’t get blasted by midday sun. Then keep the soil consistently moist. You’ll be rewarded with outstanding, sharply lobed foliage and bee-loving, bottlebrush flowers. The standard A. racemosa features fragrant, bright white flowers that can hit 48” tall above the 24-30” green, mounded foliage. 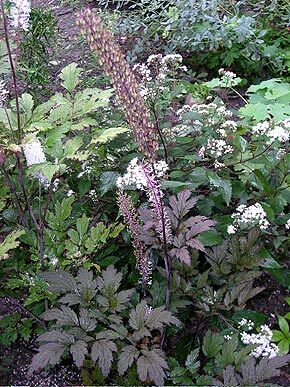 ‘Hillside Black Beauty’ has purplish-black foliage, with white flower spikes that, depending on growing conditions, will reach 4-7’. Plants can grow up to 36” wide before division is necessary. Other varieties to look for are A. racemosa’Brunette’ which hangs in the same height range but with a pink tinge to the bloom, and purplish-bronze foliage. For you USDA Zone 5 visitors (cheaters!! ), be on the lookout for a brand-new one, ‘Black Negligee’ (I just report ‘em, I don’t name ‘em) that features purplish foliage with a lavender tinge to the flower. 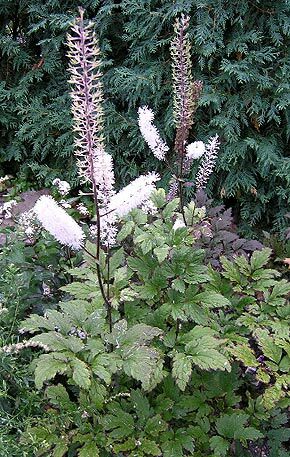 These are great perennials for the shade and woodland garden, or as native-looking transitional plants wandering off into the woods. The standard A. racemosa is hardy to Zone 3; ‘Brunette’ and ‘Hillside BB’ to Zone 4. These plants have just recently been assigned to the genus Actea; after studying cell divisions and completing DNA analysis, plant experts discovered the plant has nothing in common with its formerly assigned genus, Cimicifuga. Yes, there are people on the planet who check out this stuff for a living.